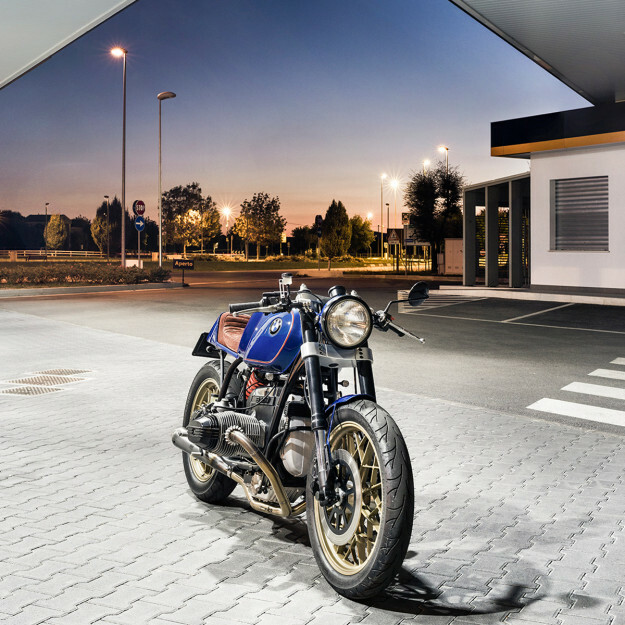 Vintage BMWs lend themselves to cafe racer builds. So we’re bombarded regularly with hordes of cookie cutter Boxers. 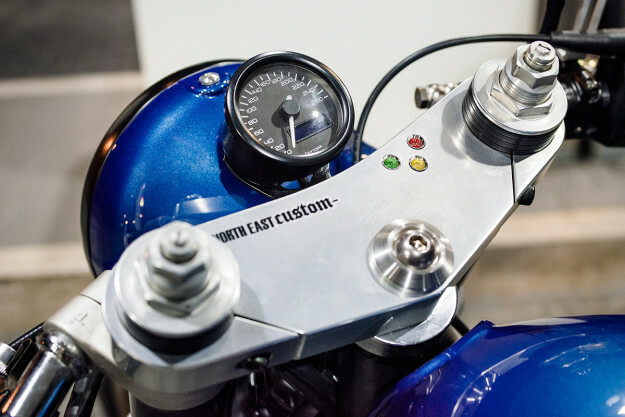 But few come close to the style and finish that North East Custom has attained here. 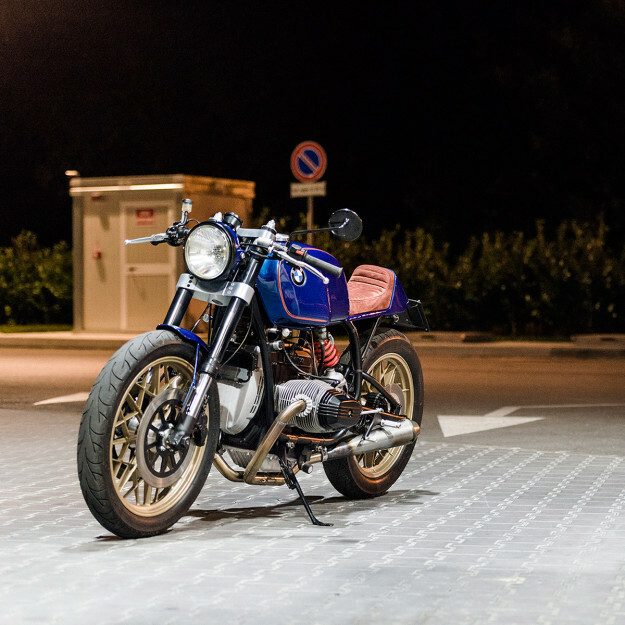 Theirs is based on a classic R100RS—and if the stellar blue paint scheme isn’t enough to draw you in, there’s a plethora of noteworthy mods to digest. It’s the first time we’re featuring North East Custom’s work, but they’ve been at it for a while. Brothers Diego and Riccardo Coppiello have been wrenching on vintage bikes and Vespas for years—but only opened their workshop full-time two years ago, in Padua, Italy. Their goal with the RS was twofold: make it elegant, and with a racing slant. Much of the elegance comes from the hand-made tailpiece, which matches the stock fuel tank. It’s sitting on a custom subframe, and hides a small Lithium-ion battery. Out back is a Guzzi taillight, with an exquisite brown saddle capping things off. The front fender is a one-off too, but the headlight is from an old Honda Four. And the requisite cafe racer ergonomics are in place—thanks to a pair of clip-ons and rear sets. But the classy silhouette that North East has cut only tells half of the story. Look closer, and you’ll notice a bespoke mono-shock setup propping up the rear. It’s kitted with a Bitubo shock; made for the Honda Hornet but adapted to fit. The front’s been beefed up to match, with a pair of Ducati Multistrada forks held in place by custom built triples. 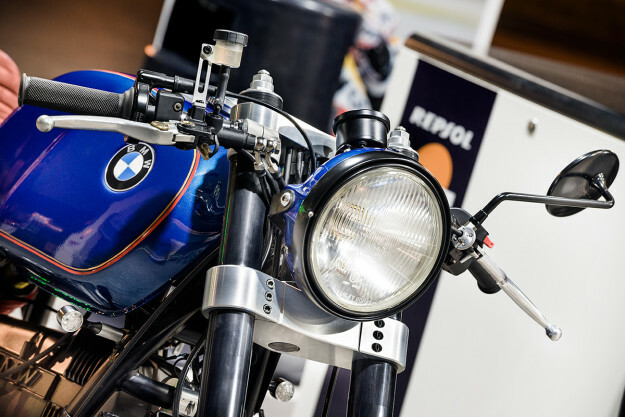 Getting the Ducati forks to work with the stock BMW wheels was no mean feat; it involved manufacturing custom brake discs, and reworking the calipers to fit. Under the hood, North East overhauled the engine, and tossed the airbox for a pair of K&Ns. There’s now a neat block-off plate where the airbox used to be, keeping the engine’s lines smooth. 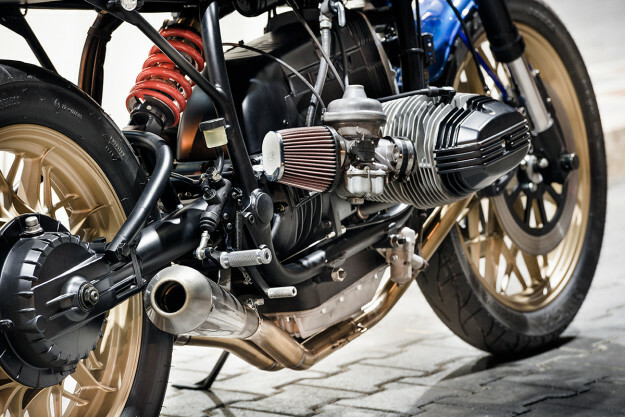 And we especially love the tight, two-into-two, hand-made exhaust system. Cast your eyes to the cockpit, where thoughtful details abound. The brothers took the time to embed the idiot lights into the top triple clamp, and thoroughly reworked the controls with neater switches, a new throttle and new levers. 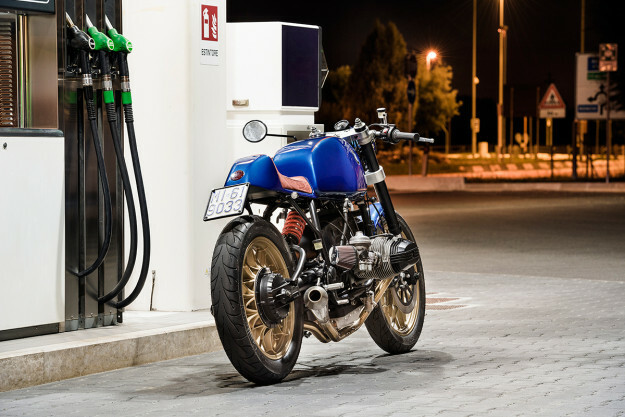 The speedo’s a classically styled unit from Daytona, and the headlight ears and gas cap were fabricated in-house. North East couldn’t have picked a better livery to wrap it all up in. 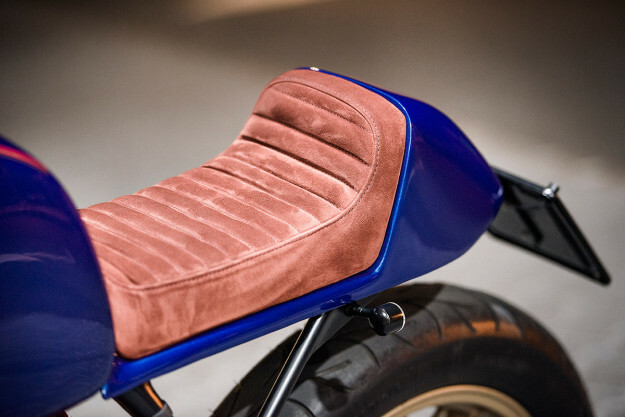 The royal blue is lifted straight from the BMW paint book, adorned with throwback pinstripes and Ducati gold rims. 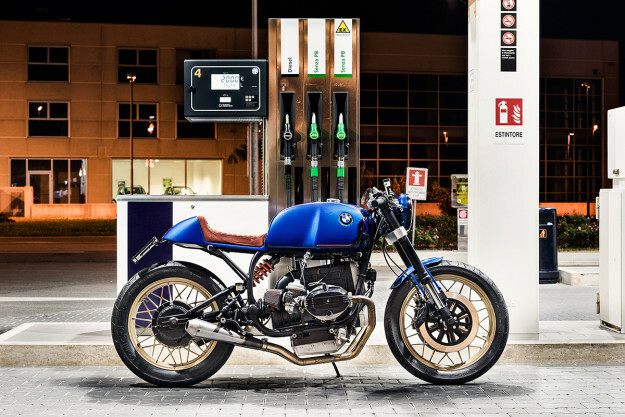 It’s the slickest BMW cafe we’ve seen in a while. And it has us itching to see what else fratelli Coppiello have up their sleeves.